Concurrent observations of the Mira variable S Ori were taken as part of a program designed to use the power of long baseline interferometry at infrared and radio wavelengths to study the photospheres and nearby circumstellar envelopes of evolved stars. Mira variables are long-period pulsating stars in the late stages of stellar evolution on their way to becoming planetary nebulae. Figure 1 (above) shows a schematic diagram of a typical Mira variable and its surrounding environment. 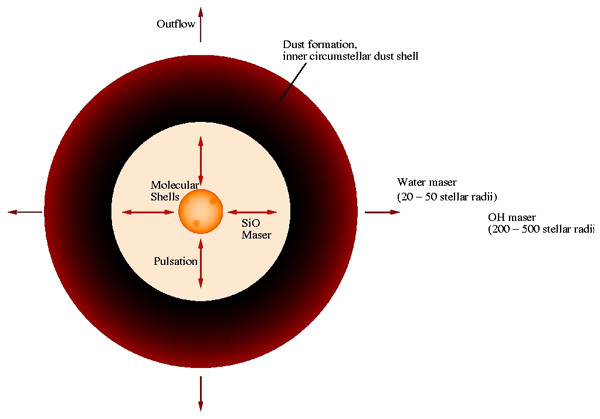 The various regions s hown in this diagram can be probed by combining observations from various interferometic facilities in a multi-wavelength study. Figure 2 (right) shows the results of the first ever coordinated observations between the VLBA and the European Southern Observatory's Very Large Telescope Interferometer (VLTI) on Mt. Paranal, Chile. The VLBA was used to observe the 43-GHz SiO maser emission (represented by the circles color-coded in bins of radial velocity) concurrent with VLTI observations of the stellar photosphere at near-infrared wavelengths (represented by the red disk in the center of the distribution). The radius of the stellar photosphere of S Ori was determined to be ~4.6 mas or ~0.9 AU at a phase of 0.73. The SiO masers were found to lie at a distance of roughly 1.7 stellar radii or 1.5 AU. Only with concurrent observations such as these can parameters of the circumstellar gas, as traced by the SiO masers, be related to the star itself at a particular phase in its pulsation cycle. Such measurements can be used to constrain models of stellar pulsation, envelope chemistry, maser generation, and stellar evolution. These observations represent the first in a series of coordinated VLTI/VLBA experiments. Future observations will take advantage of new VLTI instruments in the mid-infrared (MIDI) and the near-infrared (AMBER) providing an unprecedented view of these long-period variable giants.